ROCKPORT — George’s River Trout Unlimited (GRTU) welcomes Bonnie Holding, Casting for Recovery – Maine Program Coordinator, and Mike May, Program Lead for Togus VA Medical Center Project Healing Waters Fly Fishing, at 6 p.m. Monday, Dec. 10 at Flatbread Company, 399 Commercial Street, for a joint presentation on the healing potential of fly fishing and ways for fly fishers to get involved. Trout Unlimited is a non-profit organization with a mission dedicated to conserve, protect and restore North America’s cold water fisheries and their watersheds. The meeting will start at 6 p.m. with an informal gathering for those who wish to converse and enjoy a casual meal. The featured presentation begins at 7 p.m. GRTU conducts a raffle directly following the speaker. Membership is open to all, and the George’s River chapter welcomes individuals from midcoast and downeast Maine. Meetings are free and open to the public. Casting for Recovery (CfR) provides healing outdoor retreats for women with breast cancer. CfR’s retreats offer opportunities for women to find inspiration, discover renewed energy for life, and experience healing connections with other women and nature. Retreats are open to women with breast cancer of all ages, in all stages of treatment and recovery. CfR Maine offers one breast cancer retreat at a different sporting camp each year for 14 women. Program Coordinator Bonnie Holding has been a registered Master Maine Guide trout and salmon fishing for 32 years. Through the efforts of her and others Maine has the longest running CfR program in the nation. Project Healing Waters Fly Fishing is dedicated to the physical and emotional rehabilitation of disabled active military service personnel and disabled veterans through fly fishing and associated activities including education and outings. Programs rely on Fly Fishers International (FFI), Trout Unlimited (TU), and independent fly fishing clubs to conduct programs at DOD and VA facilities. Togus VAMC Project Lead Mike May enlisted in the U.S. Navy in August 1971. 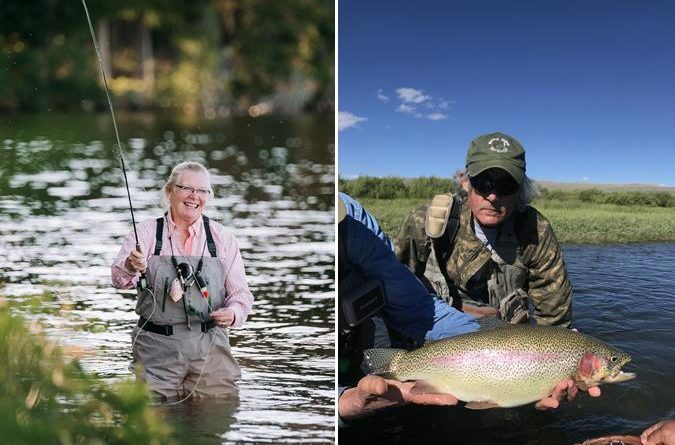 Since retiring in 2010, May has kept busy with FFI certified casting instruction, being a registered Maine guide, a Licensed New York State guide, and guide staff for Orvis, Rio, Sage, Simms and Patagonia. He joined Project Healing Waters Fly Fishing in 2010 and volunteered to be the Togus VAMC Program Lead in 2017.